There are numerous Middle Eastern restaurants in Bay Ridge but there is only one Karam. Many of these restaurants make flatbread pies that go by many names like manoush, manoushe, manousheh, mankousheh, manakish, manaqish, manaeesh or manakeesh, not to mention specialized versions like lahmacun or lahmajoun, and each of these many names goes by many spellings. Karam calls them simply “pies”. And that’s all you need to remember because they are far and away the best in the neighborhood in my opinion. The bread is fresh and supple, the toppings bright and flavorful, the aroma intense and intoxicating. 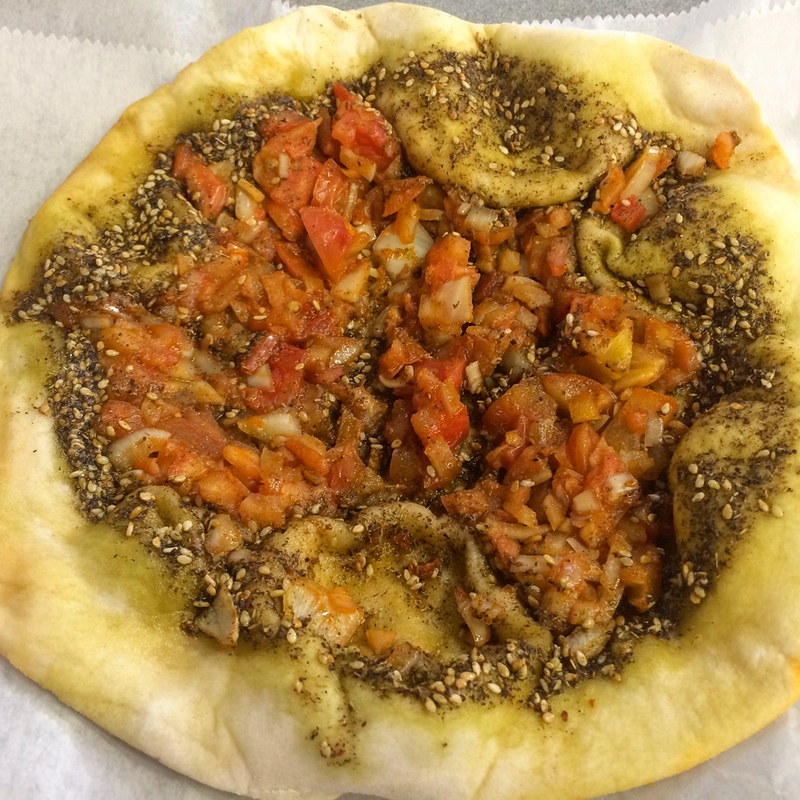 Here’s our tomato and za’atar pie, one of their many varieties. Za’atar (which itself goes by many spellings and regional recipes) is a blend of thyme and sesame seeds (the mandatory pair) and other herbs and spices like sumac, hyssop, oregano, and savory. Za’atar can be overpowering if applied with a heavy hand, but the sweet tomatoes mitigated any attempt to commandeer our palates. Try this pie. That’s not all we enjoyed that day, of course; I’ll post more from Karam, the wonderful Lebanese restaurant, soon. In the meantime, I recommend that you experience their delicious food for yourself at 8519 4th Avenue in Bay Ridge, Brooklyn.